Patrik Sandell in Canada, 2017. Unpaid bills. Allegations of abusive treatment. Explosive text messages. Car companies leaving for a competing series. Once, Red Bull Global Rallycross seemed like a bright spot in the racing world: action-packed events popular with young fans where Subarus, Volkswagens and more flew across dirt and asphalt courses. Now GRC’s future seems in doubt, and according to lawsuits obtained by Jalopnik, participants and former employees alike are left with little more than a bad taste in their mouths. On Tuesday, GRC’s 2018 season and perhaps its entire future came grinding to an apparent halt. GRC’s 2018 events website is totally blank, and Lancaster National Speedway & Dragway announced it was informed by GRC management the series had ceased operation. But according to court documents, this possible end of the series has been in the works for months, at least. GRC surprised fans with the discontinuation of its top Supercars class in February, but the lack of cars entering for 2018 may have forced its hand. Many ex-GRC teams resurfaced in the new Americas Rallycross Championship, including Subaru—which is now being sued by GRC over its withdrawal from GRC’s 2018 season. Subaru of America, the entity named in GRC’s lawsuit, has moved to dismiss the case as its lawyers say it has no merit. But Subaru’s legal counter includes allegations of abusive treatment of its employees from GRC CEO Colin Dyne, as well as mention of the series’ unpaid bills—including payments that weren’t made to drivers and vendors working with the series. Avenatti made it clear, however, that GRC felt betrayed after the series was led to believe that Subaru would participate for the 2018 season, only to have Subaru announce its withdrawal in early 2018, and subsequently, plans to compete in a new rival series. However, the hundreds of pages of legal documents from the Subaru case illustrate why GRC’s in the state it’s in today—and paint a picture of Dyne himself that’s less than flattering. Subaru says it discovered that only two Supercar teams planned to participate in the 2018 season, before Supercars were dropped from the lineup, and that GRC also wasn’t paying its bills on time. I had also received several reports that drivers and vendors associated with Alpha’s GRC racing events had not been paid or paid timely. In December 2017 and/or January 2018, Greg Lucia from Volkswagen reported that Colin Dyne had not paid Volkswagen driver Scott Speed the money he was owed, and private driver Steve Arpin separately reported that Colin Dyne had not paid him the money he was owed. Subaru’s rallycross partner, Vermont SportsCar, forwarded me reports published in Canadian media outlets that approximately six months had passed before Rockcliffe Flying Club in Ottowa [sic] was paid for its July 2017 event. Scott Speed, a former Formula One driver, is one of the more notable names in the series as GRC’s reigning three-time champion. 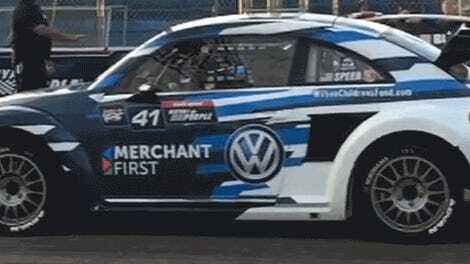 Jalopnik reached out to Speed’s Volkswagen race team and Steve Arpin for comment, and did not hear back from Speed’s team before publication. Arpin did not have comment on Subaru’s claims. Subaru’s claim about unpaid drivers and vendors is noteworthy, as multiple sources involved with the series who have spoken to Jalopnik have alleged the same thing, providing invoices and messages seen by Jalopnik to substantiate their claims of late or missing payments. While most were only willing to speak to us on the condition of anonymity out of fear of limiting future job prospects within the relatively small racing community in addition to fear of retribution from Dyne and GRC, a few have gone on the record as being owed significant sums of money well after payments were due. GRC has been sued on several occasions by various vendors and individuals—including equipment rental companies, employees and others—over breaches of contract and unpaid bills or wages, per California state court records. Cases are still pending against the series by United Rentals (breach of rental/lease), Getable (collections) and Sunstate Rentals (collections). At the federal level, the United States of America has now filed suit against GRC, seeking $441,379 in principal and interest that the government assumed from i2i Settlement Partners. GRC’s debt obligations to i2i were transferred to the U.S. after i2i president Christopher Dillon was convicted of conspiracy to commit wire fraud, originally lent GRC $750,000, per court documents. The State of Michigan also says GRC owes it $76,000 for a 2015 event hosted at Belle Isle in Detroit. Subaru’s court case refers to the rental of the Rockcliffe Flying Club’s runway for a June 2017 race. GRC owed the Ottawa, Canada, club $20,000 for seven months following the event until the CBC ran an article on the unpaid fees. Nearly eight hours after the article ran, the club received the $20,000 they were owed. But Dyne wrote off Rockcliffe’s unpaid fees as a cherry-picked example that the media blew out of proportion when we last spoke on March 2. Yet Rockcliffe wasn’t as isolated an incident as Dyne described. The latest entity to come forward about an unpaid bill is Thompson Speedway in Connecticut, which also hosted a Global Rallycross race in June 2017. Speedway CEO Jon Hoenig told Jalopnik last week that the track has only received $7,000 to date of the $36,000 they were owed for the race, and that $7,000 came in January—half a year after the series left the track. As a smaller, seasonal venue, Hoenig says that the missing $29,000 is a big chunk out of their budget. Regrettably, Subaru of America has decided to decline the GRC MFG offering for 2018. We appreciate GRC’s efforts to make concessions, but following the recent exit of other MFG-supported programs from the series and the concern of total supercar entries for 2018, we feel there’s too much instability to present our factory racing program for this season. We respect this is tough news, and we wish the series best of luck. It has not been made public exactly how steep the jump in price GRC proposed was. Subaru’s motion to dismiss redacted the dollar amounts, and the 2016 and 2017 agreements Subaru made with GRC as well as the series’ 2018 proposal are currently sealed from public view. However, it is understood to be a significant amount. How Subaru and others even came to this point is an even more fascinating story, court documents reveal. Subaru’s Patrick Sandell lines up next to Austin Dyne on the grid in New Jersey, 2017. Global Rallycross, under its business name Alpha Grp, Inc., filed a lawsuit on March 14 against Subaru of America for breach of oral contract, breaking legal promises, fraud and more in the United States District Court for the Central District of California. Notably, March 14 is the same day that FIA World Rallycross promoter IMG announced its new Americas Rallycross Championship, or ARX, to the public. It was on the same date that Subaru of America announced their plans to participate in ARX with the drivers they had previously announced for GRC this year. This action seeks redress for Subaru’s wrongful conduct committed in connection with its breach of a binding agreement to participate in a rallycross car racing series to take place in 2018 and active interference with others’ participation in that series. Subaru’s misconduct in breaching its own commitments, intentionally misleading and deceiving Red Bull GRC regarding those commitments, and intentionally inducing others to abandon the series in favor of a different series have damaged Red Bull GRC in an amount to be proven at trial, but well in excess of $75,000. Yet emails cited in the case suggest that Subaru was the last of the major manufacturer teams to leave GRC after key information about the 2018 season was not made known until January 2018. However, Avenatti is arguing GRC had an oral contract with Subaru for this year’s season, and that is an enforceable concept in the state of California. As for what constitutes that oral contract, Avenatti explained that it was “the assurances that they gave GRC, their conduct, their announcements in social media, etc.” All of these items suggested that Subaru would be sticking around in the series for the following year, and thus, the series expected that it would pay the rights fees, and participate in the series as an approved manufacturer partner. As stated in the motion to dismiss, Subaru was unable to reach agreement with GRC for 2018 and has no further commitments with GRC or Colin Dyne going forward. The lawsuit has no merit and will not affect Subaru’s new racing plans for 2018. The effect of losing Subaru, a brand synonymous with rally and rallycross in the United States, was huge on GRC’s end. With no manufacturer teams left in the series, GRC announced a complete rework of the top class—replacing the Supercars with a new spec Gold class—for the 2018 season on Feb. 27, less than four months ahead of its first 2018 race. Yet there were few takers for this last-minute rebrand. Only two drivers had announced their intention to compete this year, and multiple sources from within the series speaking on the condition of anonymity told Jalopnik that those planned to work with 2018’s all-new Gold class have been mailed their final paychecks and let go without notice last week. In court documents, Subaru claims that it and other GRC manufacturers were left in the dark for months without key details as to what that manufacturer partnership would look entail in 2018. Subaru claims it reached out to GRC for details on the 2018 season via email in October 2017. It claims it was not given any concrete details at this point or heads-up about substantial changes, and thus, expected 2018 to be much like the previous year. At this point, Subaru says that representatives from Honda and Volkswagen as well as Bryan Herta Autosport had indicated intentions to stay in the series for 2018, although they also voiced concerns about series costs. Weir said in court documents that Honda team principal Andreas Eriksson admitted their team was losing money in GRC, and Bryan Herta Autosport co-owner Sean Jones described their team’s 2017 participation in the series as “financially difficult.” Jalopnik has since reached out to these teams for comment, and will update this story if we hear back. Still, the likely presence of competing teams is why Subaru felt comfortable announcing a GRC driver lineup for 2018 in the 2017 season finale press release on Oct. 16. Court documents indicate that GRC took this press release in addition to “oral statements” made by Weir during the season finale race weekend seriously as intentions by Subaru to return. Those statements [in Subaru’s season-ending press release] do not establish a binding contract. They were made before the written 2017 sponsorship agreement had expired, contain no statements demonstrating an exchange of consideration, and do not state the parties had reached an agreement for the 2018 season. At most, those statements were an aspirational expression of interest that cannot give rise to a contract. After this announcement, Subaru finally received a response from Alpha Grp’s Chief Strategy Officer Colby Rodriguez about the 2018 season on Oct. 20. In GRC’s proposal for the 2018 corporate sponsorship agreement, sponsorship fees rose significantly, and many formerly optional expenses were now presented as mandatory. Later emails in early December between Volkswagen, Honda and Subaru representatives say that GRC’s other top class marques hadn’t received the details they needed to properly evaluate their 2018 season participation, and were likewise concerned about the higher fees. “I have given up on getting any real data from Colin/GRC. Sends up big red flags that it isn’t readily provided,” Honda National Advertising Manager Alicia Jones wrote in one of the December emails cited in court documents. On Dec. 18, a Honda representative notified GRC as well as Subaru and Volkswagen that they would not be participating in the series in 2018. A Honda representative told Jalopnik in March that the company felt as if the GRC program had already accomplished all it could in promoting the new Civic, which had been competing in GRC for the past two years. Additionally, Honda’s Global Rallycross partner Olsbergs MSE (the team which ran its factory cars) will now focus primarily on their European rallycross efforts with Ford, according to the Honda contact who spoke with Jalopnik. Hondas and a Ford jumping in Tennessee, 2017. It was at a January meeting between representatives of GRC, Volkswagen, Subaru and other teams in Detroit that Subaru alleges that the terms for being a manufacturer partner changed drastically from what they all had come to expect from the series, particularly in regards to car counts and fees. Volkswagen’s representative confirmed it would not participate in the 2018 season towards the end of the January meeting, according to court documents, which would leave Subaru as the only manufacturer. GRC made a follow-up proposal to Subaru after the meeting offering a reduction in fees for 2018 and a guarantee of at least 10 Supercars at each event, but that proposal also noted that fees would increase in 2019. At this point, Subaru wanted to verify some of the claims GRC was making about car counts and other items. Court documents show that GRC believes that Subaru was acting to switch their commitment to an unnamed “co-conspirator” series starting in late December. That’s an interesting and particularly incendiary phrasing, more common in criminal cases rather than civil ones. However, in spite of Subaru’s stated and binding commitment to participate in the 2018 series, upon information and belief, as of late December 2017, Rob Weir of Subaru contacted an unnamed third-party entertainment, sports and event management company (“Co-conspirator Co.”), and falsely stated to them that Red Bull GRC was not going to be running a racing series in 2018. Thereafter, also in late January of 2018, if not sooner, Rob Weir of Subaru hosted a different meeting in Detroit inviting many of GRC’s teams, drivers, sponsors, and other car makers such as Volkswagen Group of America to participate. Red Bull GRC was not invited to this meeting in Detroit. Upon information and belief, the purpose of this meeting was to induce Co-conspirator Co., to launch a race series in the U.S.
Further, upon information and belief, the purpose of the second Detroit meeting instituted by Subaru was to induce or otherwise cause the parties to this meeting, such as Volkswagen Group of America, to abandon the Red Bull GRC series immediately and participate instead in the Co-conspirator Co. series. Regardless, GRC alleges that this behind-closed-doors meeting to entice GRC’s teams to switch series happened around the same time as GRC’s own January meeting with teams to discuss the 2018 season details. GRC also alleges that proprietary information from GRC’s meeting regarding the 2018 GRC season was shared with the co-conspirator series in order to help them form the new series through a dial-in that was shared with a representative of that series. Thus, GRC blames Subaru for the withdrawal of Volkswagen from the 2018 GRC season—flipping the timeline that Subaru gave for the final two manufacturers’ withdrawal. Dyne also claimed he wasn’t sure what Volkswagen’s plans were when he spoke with Jalopnik on March 2, even though Subaru alleges that Volkswagen pulled out of GRC before they did and like Subaru, Volkswagen resurfaced as an ARX competitor for 2018. “We’re waiting for [Volkswagen] to make a decision as to exactly what they’re going to do,” Dyne told us then. Subaru, of course, disputes GRC’s version of the events leading up to their withdrawal from the series in its own legal filings. Jalopnik has reached out to both Subaru and World Rallycross’ promoters for clarification on when Subaru became involved in the new Americas Rallycross Championship. However, we have not received an answer at the time of this writing. We also understand that Mr. Dyne has physically assaulted Mr. Weir, by poking a finger in Weir’s chest while yelling at him, on at least one prior occasion at a public racing event. Because Subaru alleged that this was a pattern of behavior that began before it ever quit GRC, its legal counsel demanded that Dyne “immediately cease all individual contact” with Subaru personnel, including physically staying away from them in person. Subaru’s motion to dismiss argues that Dyne’s behavior outside of court should factor into the decision made on GRC’s claims. GRC series cofounder Brian Gale also noted similar behavior from Dyne in a counter-suit he filed against Alpha Grp in 2017, in which Gale alleged the series engaged in slander, breach of contract and intentional interference with his prospective business relationships. Gale had left GRC in 2014, and was sued by Alpha in 2017 after the series learned Gale was starting a new motorsports competition called Speedleague, in which they allege that Gale violated the terms of their settlement, disclosed confidential series information and misrepresented his time with GRC. Yet Gale’s counter-suit also alleges that Dyne broke the terms of this settlement after he learned of Speedleague. Gale claims Dyne sent him the words “you have poked the BEAR.” via text after he found out about Gale’s new business. Dyne allegedly told a friend of an investor who was interested in Speedleague as well as ESPN’s Vice President of Programming and Head of X Games Scott Guglielmino that Gale had stolen funds from Alpha, per Gale’s countersuit. The lawsuits between Gale and Alpha Grp are still pending. Steve Arpin, Tanner Foust and Patrik Sandell line up in Kentucky, 2017. What Happens To GRC Now? When Subaru pulled out of GRC, Dyne all but admitted to Jalopnik that it forced the series to make big, hard changes. The 2018 season went from being business as usual to a transitional year, easing into new car classes. On Feb. 27, GRC announced the creation of two new classes that were supposed run in the place of their top Supercars class: Gold and Platinum. The Gold class was set to start running this year, and the Platinum class—now set for 2019—was to slot in above the Gold class with a spec, purpose-built tube frame race car that was lighter, less expensive, more durable and more nimble than the current Supercars. In spite of all the uncertainty, Dyne seemed enthusiastic about the Gold class idea when we spoke on March 2, as it was a lower-cost way to give privateer teams a fighting chance against any manufacturer efforts who wanted to come into the series and run the more spec car. But that was before Tuesday’s news, and the blank events page on GRC’s website speaks volumes. Until today, rumors of trouble at GRC were spoken about in hushed tones by those in the racing community, with many afraid to come forward for fear of losing future jobs or lawsuits. Yet with most of GRC’s old teams moving to the new ARX series, it seems as though the chatter about GRC not holding up to its obligations as a racing series is finally getting dragged out of the shadows and into the open—right there in court records for all to see. Additional reporting by Alanis King. 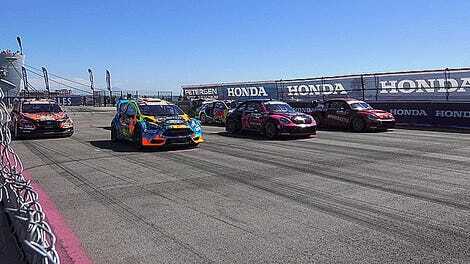 If you have any further insight on what’s happening with Global Rallycross, drop us a line at tips@jalopnik.com. You can also find how to contact us confidentially through SecureDrop here.